All the electrical equipment should be grounded by means of conductors and should avoid relying only on raceways for surge protection. This is a protective standard set by the IEEE. Care should be taken to see that the size of the grounding conductors, match that of the phase conductors, to decrease the impedance in the circuit and enhance the clearing time in an attempt to safeguard the equipment. It is also required that all the raceways, boxes, metal enclosures and grounding conductors are bonded to a single grounding path. In case of sensitive electrical equipment, an isolated grounding system can be employed in order to supply good signal reference and to enhance its overall operational effectiveness. 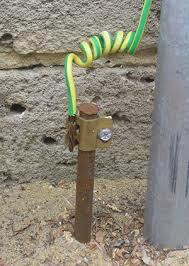 This type of segregated grounding system is represented in green colored conductors with yellow stripes running on them. Unlike other conductors, isolated/insulated grounding conductor does not connect the metal casing; in fact it is insulated from the casing and runs itself down all the way to a separate grounding system. Note: Isolated/insulated grounding system is known to reduce the noise that tries to enter the sensitive equipment through the grounding conductors. This is because, the pin that is used to ground is not electrically connected to the conductor in case of isolated/insulated grounding system. It is suggested that you replace all the branch circuits that are not grounded with branch circuits that are properly grounded. Sensitive equipment such as computers, digital circuits, and computer controlled machines need proper grounding in order to operate effectively. If such electrical equipment is not earthed properly, static electricity and voltage spikes can damage the systems extensively. Note: It is always wise to use surge protection devices (SPDs) in conjunction with grounding conductors of the equipment in order to ensure optimum protection from fault currents. 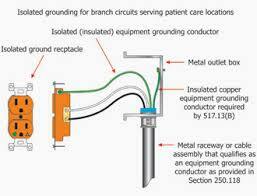 It is important to periodically measure the grounding conductor’s resistance to the ground. If this resistance is higher than 25 Ohms, necessary measures should be employed to reduce the ground resistance to less than 25 Ohms. To ensure better safety of the equipment, it is encouraged that the readings be taken after every six months. These tests are normally conducted with the help of a ground resistance meter and the readings thus obtained are documented for future reference. If a substantial difference id found between two consecutive readings, it means that the ground resistance has increased dramatically and so is the clearance time. This can enormously decrease the life span of the sensitive components in the electrical equipment. If this is the case, one should immediately consult an electrical design engineer and take appropriate steps to decrease the ground resistance. Note: in case of industries, ground resistance should be less than 5 Ohms. And sometimes, in special cases, it is required that ground resistance is no more than 1 Ohm. 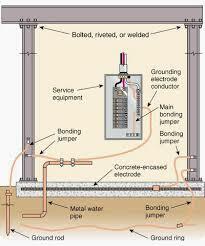 According to the standards set by NEC, grounding rods can be installed six feet away from the source. Though this is the recommended standard, it always a good idea to install the grounding rods at a distance equivalent to twice its length. When installing grounding rods in high altitude areas, mountains and rocky terrains, it is recommended that you make use of deep-driven grounding rods. Alternatively, chemically-enhanced grounding rods can also be used in such locations as well as in locations where the condition of the soil is too poor. Ground rings made of copper are extensively used at substations and commercial establishments, such as apartments and supermarkets, etc. These ground rings are often supplemented by grounding rods along with water piping encased in metal, structural steel and electrodes that are encased in concrete. 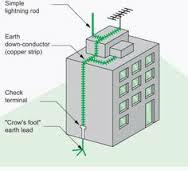 Installing ground rings around your building, a few feet away from the structural blueprint can ensure maximum protection of the household electrical equipment. In cases where the ground resistance is high, supplement the rings with deep-driven grounding rods to lessen the impedance. 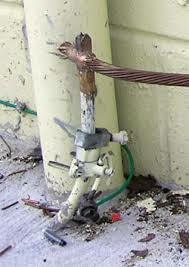 Generally, ground rods having triplex configuration are to be used for such purposes, as per the code. According to the standards set by the NEC, a minimum of 2 AWG sized ground rings are to be used at the apartments and the commercial sites. But in practice, it is found that ground rings as large as 500 kcmil are used for grounding purposes, in an attempt to reduce the ground resistance in the future. 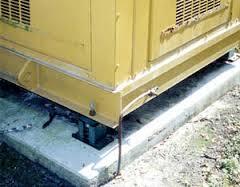 This can prove to be quite an effective grounding system. Note: Ground rings serve as a great place to connect multiple grounding conductors, such as lightning conductors, Ufer groundings and vertically designed electrodes. Using this single grounding electrode system, you can effectively bond all you domestic electrical equipment that need grounding such as television, telephones, antennas and radio towers, etc. When installing grounding systems, for protecting the electrical equipment during lightning strikes, make it a point to use a copper grounding system. This is because, copper is far more superior compared to other metals and alloys, as far as the rate of discharging the fault current into the ground is concerned. This is also prove to be a cost effective alternative, because copper does not corrode quickly and also needs less maintenance when compared to the other metals. 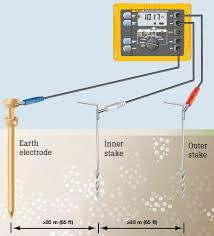 Note: Since, lightning strikes are capable of generating very high voltage spikes; care should be taken to see that the grounding system intended for this purpose makes use of high quality, low impedance and robust grounding electrodes. Using SPDs at critical equipment is always encouraged. They can quite effectively jolt down the fault currents when properly connected to high quality, low impedance and robust grounding electrodes. In conclusion, I would finally like to reaffirm that, following proper grounding standards will not only keep your electrical equipment safe, but will also safeguard your loved ones from any electrical mishaps. Though initial investment to install a quality grounding system may be a bit heavy on your pocket, but in the long run, it is definitely going to repay you in form of increased safety of your sensitive equipment and family. Do know have other recommanded practices? 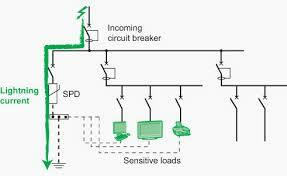 or copy this trackback: http://engineering.electrical-equipment.org/safety/9-best-recommended-grounding-practices-for-safety-and-power-quality.html/trackback from your own site. Thanks a lot Steven for your very helpful information. HI, I’m sitting with a problem where people shock when they use the shower, especially when they touches the warm water tap. The Continuity of the earth system is 0.2 ohms, the insulation resistance test reading is infinitive. It is a three phases system.The Municipality already supply a separate earth cable but the people still shock. The shock is not that intense, but they feel the static especially when they got a cut on their fingers.I tested the system with wet hands but everything seems to be ok but when they shower they feel the shock.This happened greatly on the warm water tap.